You can visit all the beaches nearby Diafani as well as the island Saria on the northern side of Karpathos by our tourist boat “NIKOS”. 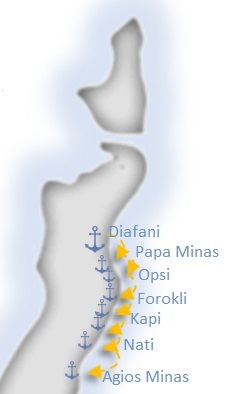 Captain Nikos Orfanos will guarantee a very safe and unforgettable trip to the most beautiful areas of our island. 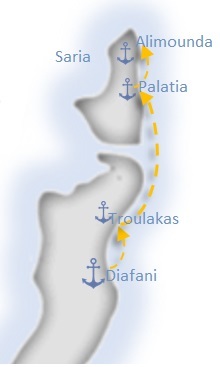 The boat departs every day from the small port in Diafani at 10:00 and is back at about 18:30. Saria lies on the northern side of Karpathos. It’s a small island with no inhabitants (maybe some goats and donkeys!). It is divided from Karpathos through a channel called “steno” (means “narrow”). The beauty of this island is unique and the only way to explore it is…. by boat. Our first short stop is in the sea cave at Troulakas”,still on the island of Karpathos. There you can swim in the amazing blue-green waters before we continue out trip. Combine your excursion with hiking! 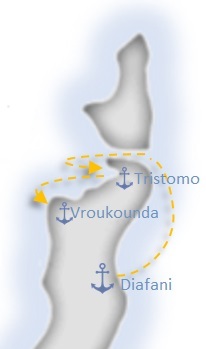 “Tristomo” is a natural port that lies on the north-west side of Karpathos. It is a small village with no inhabitants anymore (Only an old couple used to live there till 2015 when the lady passed away). In our excursion, it will be our first stop. There you can explore the village and swim. After Tristomo, we will visit “Vroukounda” where we will spend the rest of our day and have lunch (barbecue and salads) . Vroukounda is one of the 4 ancient cities of Karpathos (ancient “Vrykous”) during the 3rd – 4th century b.C. There you can visit the “invisible” cave-church of St. Ioanis (John). The festival of St.Ioanis on the 28-29 of August is one of the most famous ones on our island.